Latvia’s airBaltic, the leading airline of the Baltic states, has announced new plans for in-house base maintenance capabilities for the Airbus A220-300. The move is part of the carrier’s declared development strategy, which will see its fleet completely reshaped by 2023 – by phasing out all aircraft types other than the A220 (formerly the Bombardier CSeries 300), gradually bringing the number of the latter to 80 aircraft. airBaltic’s 34-strong fleet currently consists of 14 Airbus A220-300s, 8 Boeing 737-300/500s and 12 Bombardier Q400 turboprops. As of today, its MRO (maintenance, repair and overhaul) capabilities are limited to line maintenance on all types it operates, and it is forced to resort to outsourcing for heavy checks. Approval for C-checks on the Airbus A220 type is expected by autumn 2019 and will be a first, according to Andris Vaivads, the airline’s technical director, as explained to ATO.ru, Russian Aviation Insider’s sister publication. The first C-check is scheduled for the same period at the airline’s hangar facilities located at its Riga airport base. The airline has recently acquired additional hangar facilities that can handle three A220-sized aircraft simultaneously, and also rents extra hangar space. Nevertheless, considering the airline’s fleet expansion plans, existing maintenance capabilities will need to be expanded, Vaivads admits, adding that the company is also planning to offer maintenance services to other Airbus A220 operators, such as Swiss or Korean Air. 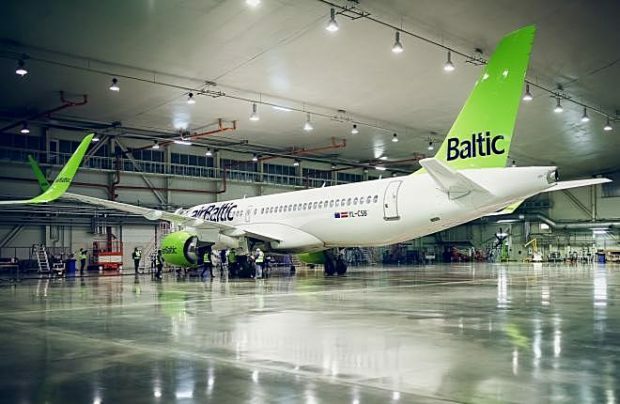 airBaltic, which is expecting to be able to offer an attractive menu of prices thereby making it a strong competitor to west European aircraft service rivals, is negotiating with Riga airport over more land for the construction of another hangar. The airline has only recently launched a line maintenance station for its Q400s at Tallinn airport, in neighbouring Estonia, and also plans to use this facility for A220 line maintenance servicing.